There are two caveats: (1) Concentrated investing is not for everyone. (2) The book is a roadmap, not a benchmark. Managed GEICO’s investment portfolio from 1979 to 2010 averaging a 20.3% return, beating the S&P 500 by 6.8%. Was willing it to hold a small number of positions with little turnover, including concentrated sectors bets — multiple stocks from one sector, did M&A arbitrage, and was willing to hold a cash position absent opportunities. Think Independently: Be skeptical, avoid irrational behavior that drives market prices to excess, don’t avoid unpopular companies. Invest for the long term: The short term is too unpredictable to guess the swings accurately but would increase transaction costs and taxes. Often traded around a core position. Prior to the Crash of ’29, Keynes was more of a top-down macro speculator, betting on commodity and currency moves, and doing it on margin. After ’29, he transitioned to more of a concentrated value investor. Though, he continued to use margin in his personal account. Keynes ran the Chest Fund and a second Fund B for King’s College, as well as advised on the portfolio’s of two Insurance Companies. The Chest Fund earned a 9.12% annual return compared to a UK index of -0.11% over the same period 1928 – 1945. Charlie Munger realized that the biggest problem with most fund types is the ability of clients/partners/shareholders to withdrawal capital at sub-optimal times. Having permanent capital removes that problem, which also helped people like Buffett, Munger, Simpson, Keynes, etc. by not having to think about beating a benchmark or short term returns. Instead, allowing them to maintain a concentrated portfolio with a long term focus. Munger and Buffett found permanent capital via the float of insurance companies and Blue Chip Stamps. The goal is to optimize position size for maximum gain while avoiding catastrophic loss, but only when you have an edge. Without an edge, no bet is made. Ed Thorp popularized Kelly betting but only recommended fractional-Kelly bets for two reasons: 1) full Kelly bets could produce bigger drawdowns than most could handle, 2) full Kelly bets are likely overestimated due to an underestimated (or error) probability of a catastrophic event (i.e. Black Swans). The question of a concentrated versus diversified portfolio is the tradeoff between reducing risk through diversity or potentially maximizing returns via concentration. The more diversified you get, taken to an extreme, means a greater likelihood of earning market returns. 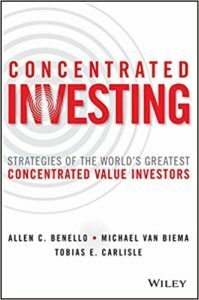 The more concentrated, taken to an extreme, means a greater likelihood of deviating from the market return but also increases the risks associated with any single stock. So the right number of stocks to own depends on the individual, their skill level, and their ability to handle not only higher volatility that comes with a concentrated portfolio, but permanent losses from any one stock. Permanent losses are the most important risk to protect against. 1977 study, Risk Reduction and Portfolio Size, showed most of the benefits of diversification regarding risk reduction (idiosyncratic risk) was achieved when owning 20 to 30 securities. Owning more produced a minimal increase in benefits. However, the more concentrated portfolios tend to produce a wider range of possible returns that deviate from the market average. By combining a concentrated portfolio with a factor like value, that has shown a history of potential outperformance, increases the chance that the portfolio outperforms the market average in the long run. A concentrated portfolio, based on a solid value strategy, only works in the long run, if the investor accepts the likelihood of higher volatility and underperforming the market average in the short run. The right temperament is key.